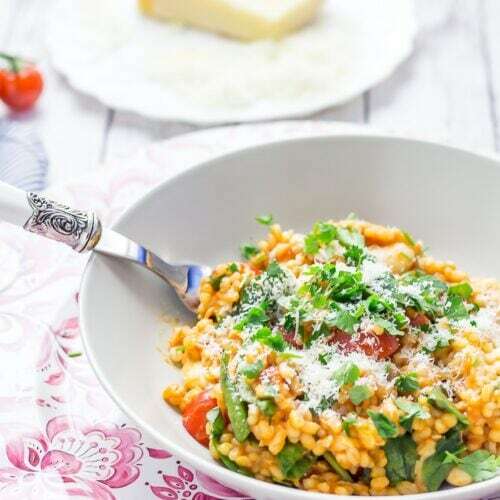 It takes one pot and just seven ingredients to make this cheesy pearl barley with tomatoes, spinach and butter beans! This is the ultimate healthy comfort food. Sometimes you just need bowl food for dinner. I enjoy dinners that I can eat curled up on the sofa while watching TV (speaking of, what are you watching right now…we’re in between shows and it’s driving me craaazy). Pearl barley is perfect for a bowl dinner since it’s small enough to scoop up spoonfulls of and shovel directly into my mouth. 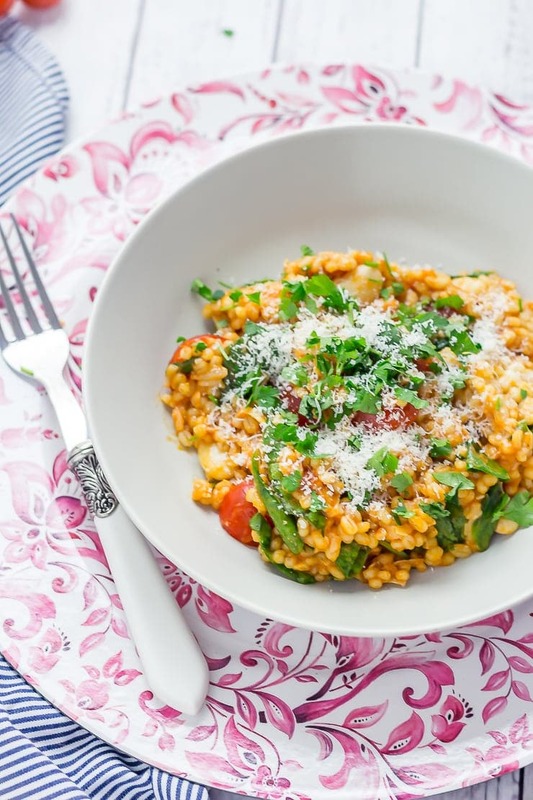 This cheesy pearl barley is especially good because it’s also so easy to make. 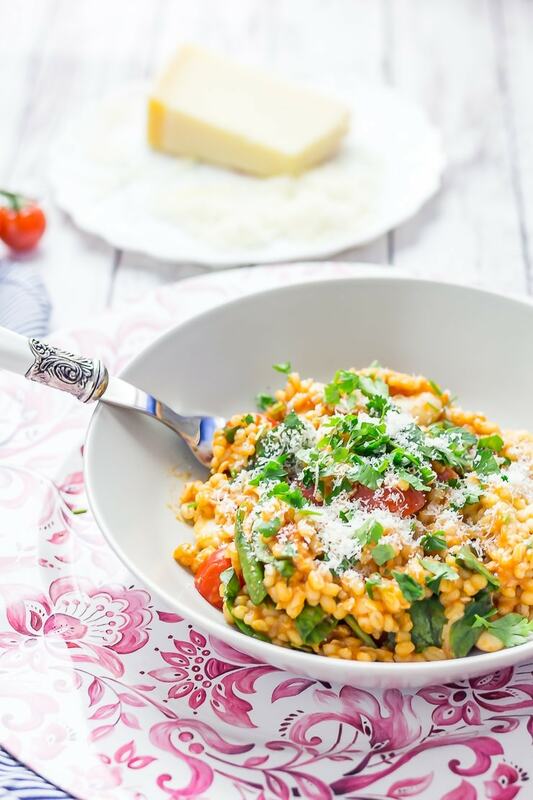 Click here to pin this one pot cheesy pearl barley for later! We totally eat dinner on our laps in front of the TV every night. 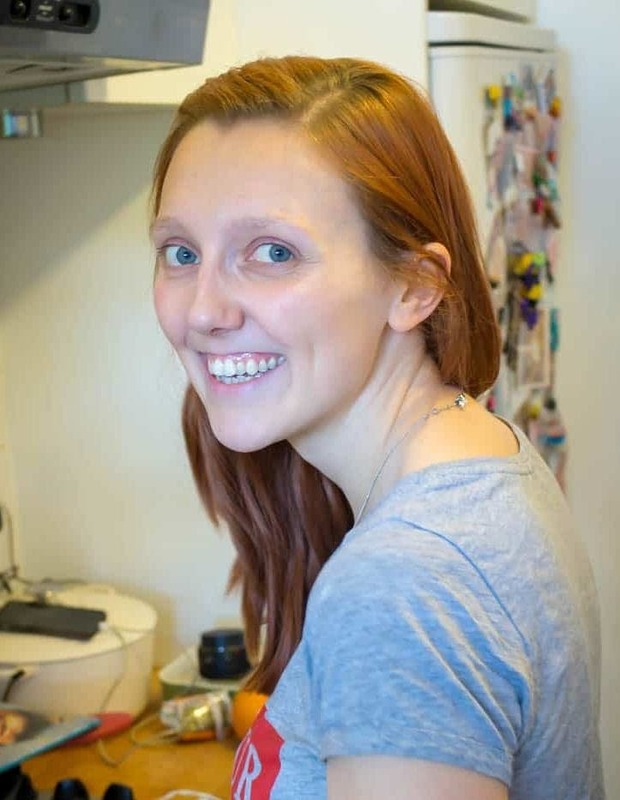 Which brings me some shame because I feel like I should be a really wholesome person who sits at the table every night with candles and has deep heart to hearts with my boyfriend. That actually sounds really lovely but somehow the lure of the TV and the sofa is just too strong. 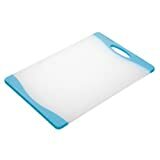 I even have one of those trays with padding on the bottom that I use to eat dinner off like I’m on old lady. Even better, when I’m eating a bowl dinner like this cheesy pearl barley I don’t even need the padded tray because it’s a total one hand one spoon situation. The dream. And of course we love watching TV while we eat. I’m currently re-watching Scandal because I haven’t seen the final few seasons and I fully love Shonda Rhimes and all her amazing TV shows. 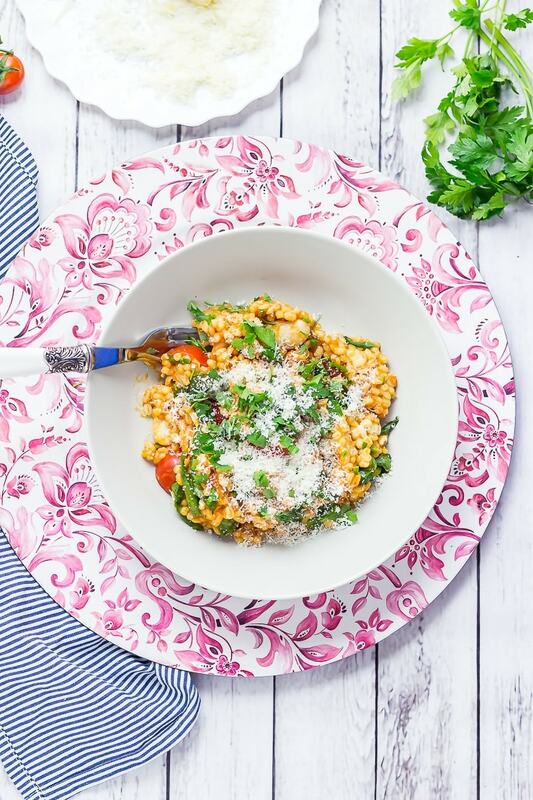 Whatever we’re watching this cheesy pearl barley is one of our favourite things to be eating for dinner. 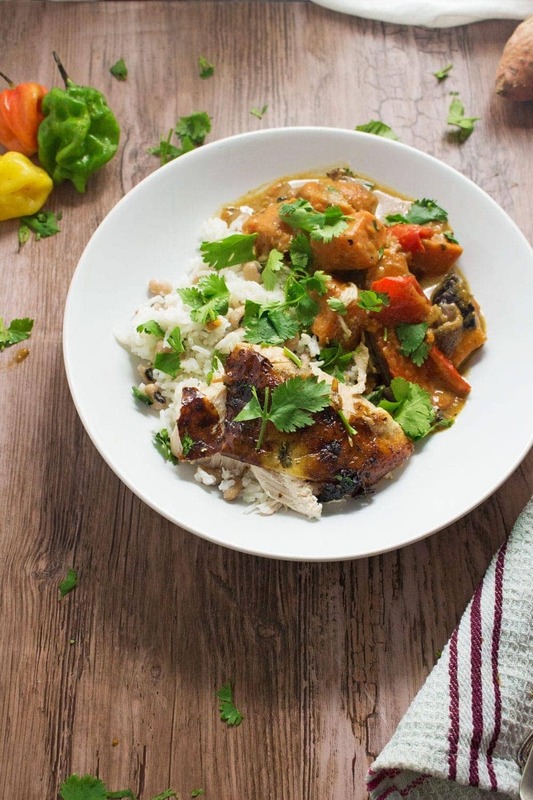 It’s so super easy and only needs 7 ingredients which makes it perfect for a weeknight dinner. So let’s talk pearl barley for a sec. 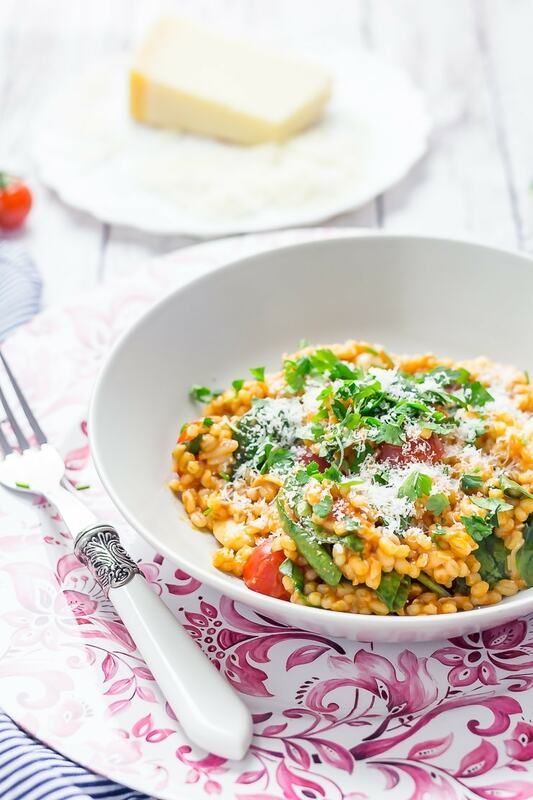 I love pearl barley but don’t cook it as often as I’d like because it takes a little longer than ideal to cook. We’re talking 45 minutes or so. Which isn’t a deal breaker and you could definitely cook your pearl barley according to package instructions and you’ll still have dinner on the table in under an hour. Just like I did with this recipe for herby barley with halloumi recipe last summer. 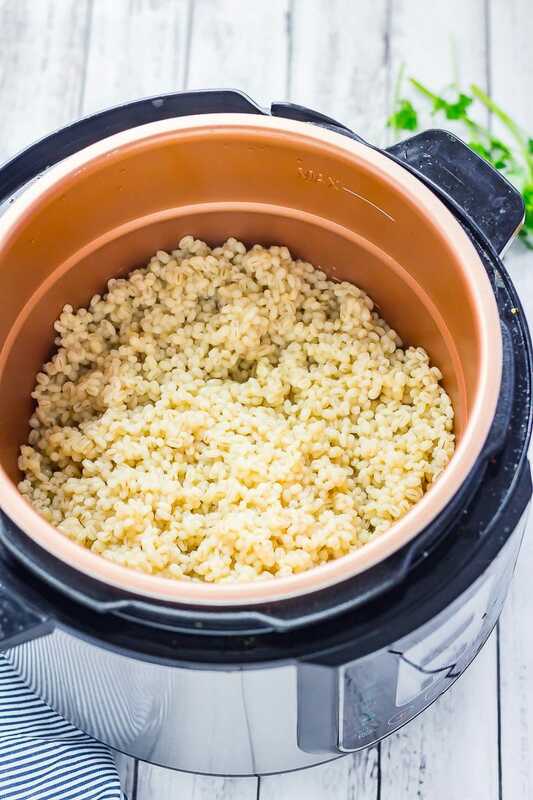 But for this recipe I cooked my pearl barley in the pressure cooker (we have the pressure king pro and I love it!) and it cooked in less than half the time. Which is truly amazing because it means that now I can eat pearl barley whenever I want without the waiting around! Once the pearl barley has cooked everything else comes together really quickly. It’s literally just a case of stirring through the rest of your ingredients and giving the spinach 2 minutes to wilt before serving. 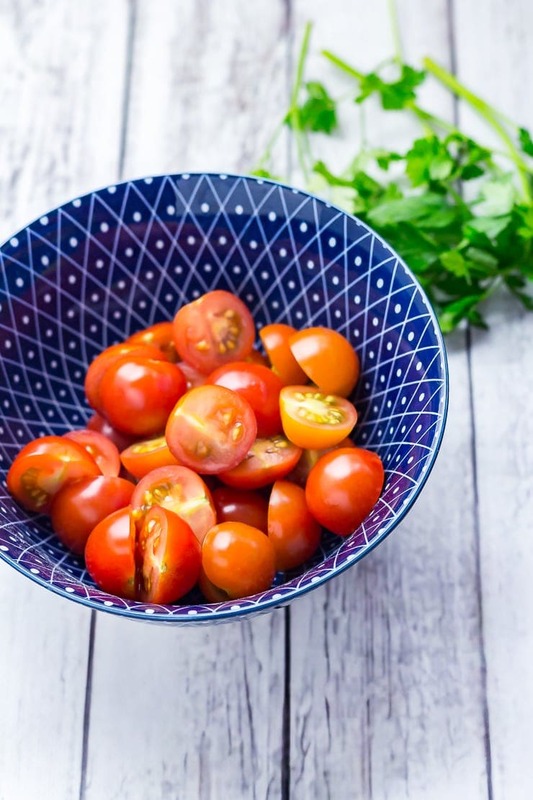 I even use ready made tomato sauce in this recipe to make it as quick and simple as possible. 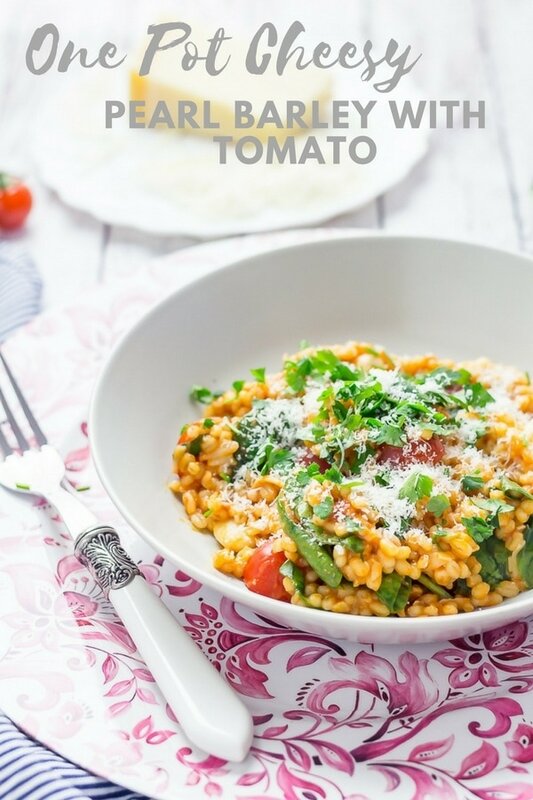 If you prefer homemade then you could definitely go with that, I just wanted to make this a truly weeknight meal and the fab thing about using ready made is that you can put your pearl barley on to cook and then go off and do other things then come back to it just before you’re ready to eat. You can get pearl barley at your normal supermarket, just look where you find all the other grains. Does pearl barley contain gluten? Unfortunately for all you gluten free friends pearl barley does contain gluten. 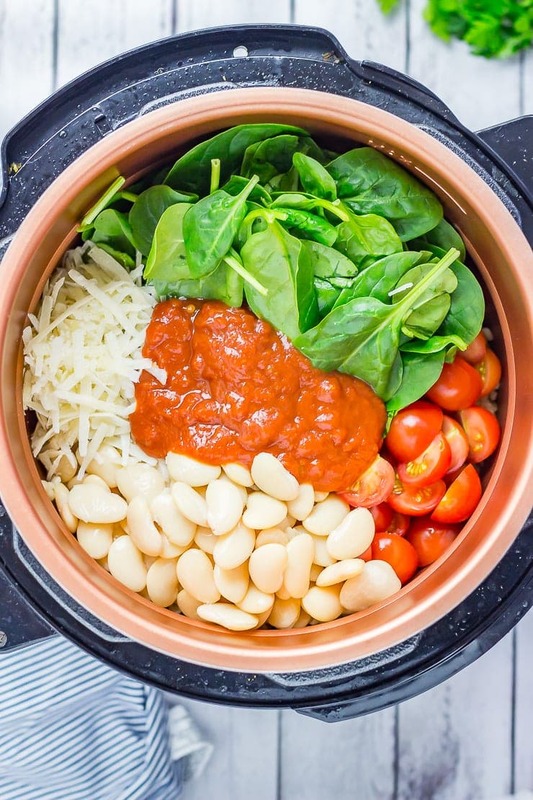 If you use a pressure cooker you can simply add the tomato sauce, tomatoes, beans, spinach and cheese to the pot and stir everything together. I like to place the lid back on for a couple of minutes and just let it sit to allow the spinach to wilt and the other ingredients to heat through. 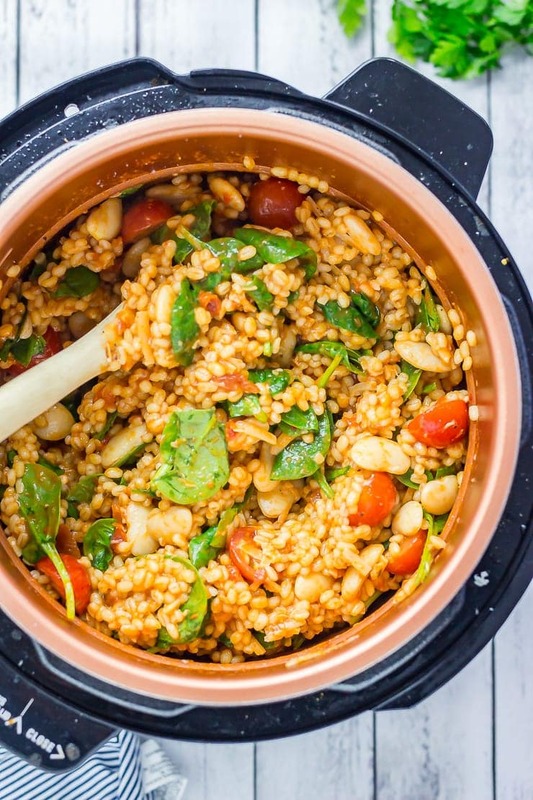 Even if you don’t use a pressure cooker and just cook the pearl barley on the stovetop then you can do exactly the same by adding all your ingredients to the hot pan once all the stock has been absorbed. Simply add the pearl barley to a saucepan with a lid along with the stock and a little salt and pepper. Stir then bring to the boil and simmer, covered, for about 45 minutes. Keep an eye on the pot to make sure it doesn’t get too dry and add more stock if necessary. When it’s finished cooking and absorbed all the liquid simply fluff with a fork and serve. Oh, another amazing thing about this recipe? It’s super customisable. Don’t have butter beans but got some cannellini beans? Chuck them in instead. Want to add kale instead of spinach? Go for it. 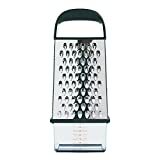 Try a different sort of cheese or adding any other vegetables you have on hand. It really will turn out so delicious whatever you do, I promise. Want more? 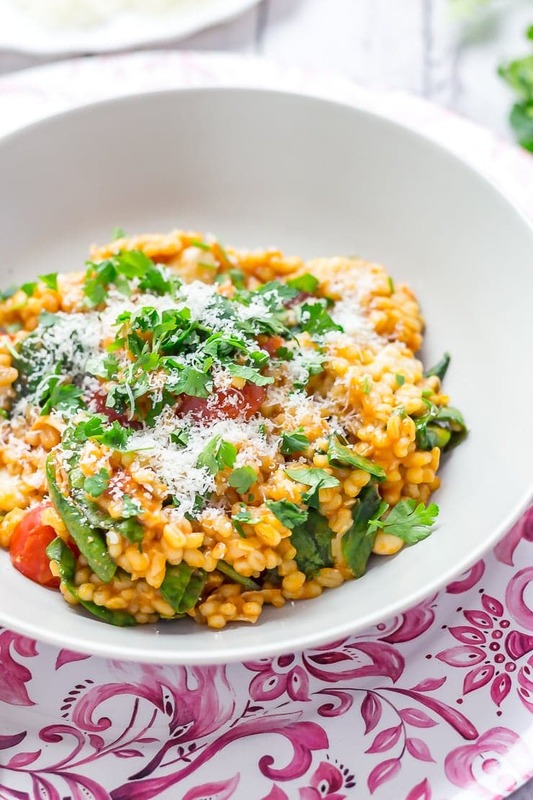 Try these other pearl barley recipes! Add the pearl barley and vegetable stock to the pressure cooker with a sprinkling of salt and pepper. Cook on the rice setting for 20 minutes. Release the pressure then add the beans, tomatoes, spinach, parmesan and tomato sauce to the barley and stir together. Place the lid back on for a minute to allow the spinach to wilt. Serve topped with a sprinkle of parmesan and fresh parsley. This sounds so delicious! I love meals like this. I hear you on eating dinner though. I typically wolf something down while working on my laptop, and my boyfriend sits on the couch and eats. Romantic stuff LOL. We make it an effort to have one dinner we we sit together and eat. Anyways, great recipe! That’s a really good idea, we should definitely try and start that routine! this looks delicious and healthy food! Looks like a delicious bowl of food for sure. We’re guilty of curling up on the sofas too for dinner – with our kids! We like watching Master Chef Jr. together and Little Big Shots. As far as Netflix, I re-watched The Office with my 13 year old son which was highly entertaining. I’m just finishing up Gilmore Girls with my daughter. When we watch late night without the kids I’m into darker stuff – Ozark and Mind Hunters were my recent favorites! Ohhh I love The Office so much, it’s not on the UK Netflix which is so annoying!! We tried Ozark but didn’t finish it, I might give it another go 🙂 Thanks for the recommendations! I used to be a sucker for dinner in front of the TV too… until we had kids, now we eat at the table 90% of the time, anyways. This looks like such a hearty and delicious dish. It would be a great entree OR side dish to a BBQ dinner! Ohhh yeah, it’s great cold too so would be fab for a bbq!